There are about two dozen empty storefronts along Biscayne Boulevard in the MiMo District. UPDATED, April 1, 11:42 A.M.The MiMo District in Miami has the key ingredients for becoming the city’s next hot retail destination. In recent years, popular homegrown restaurants and casual dining spots such as Blue Collar, Moshi Moshi, Loba, Ms. Cheezious, Dogma Grill and Panther Coffee have brought a hipster flair to the stretch of Biscayne Boulevard from 62nd Street to 79th Street. 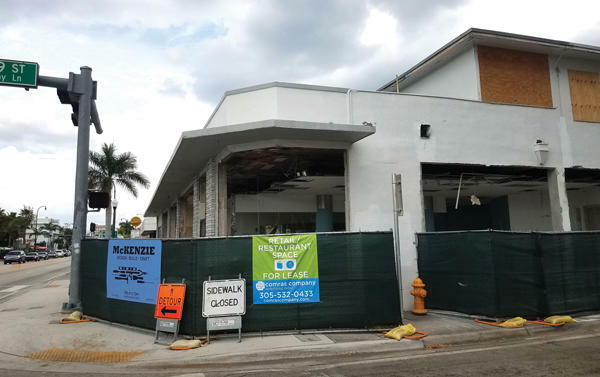 Since developer Avra Jain’s successful reopening four years ago of the 1950s-era Vagabond Hotel at 7301 Biscayne Boulevard, other MiMo District commercial property owners have invested in renovating their older, historically designated buildings. The area is sandwiched between two affluent single-family neighborhoods: Belle Meade on the north and Morningside on the south. Yet Biscayne Boulevard traffic congestion, a parking shortage and unrealistic rental rate expectations are short-circuiting MiMo District landlords’ efforts to lure retail tenants, according to brokers who are listing commercial spaces in the neighborhood. Since the beginning of the fourth quarter of 2018, two dozen empty storefronts along Biscayne Boulevard now have “for lease” signs. Graber, whose brokerage and development company is headquartered in the Balans building at 6701 Biscayne Boulevard, said the MiMo District, which is largely made up of one- and two-story buildings designed in the Miami Modern architectural style, lacks vibrant pedestrian areas with office buildings, on-street parking and garages like the Design District and Midtown Miami, two urban retail centers located just two miles south. Compounding the lack of pedestrian activity are investors who purchased commercial buildings in the MiMo District at the height of the market between 2013 and 2015 and overpaid for those properties, Graber said. He noted that commercial buildings housing tenants who paid “local mom-and-pop rents” traded at a premium. “Today, these buildings are asking for too much money, and they remain vacant,” Graber said. For instance, Greenstreet Partners paid $5.8 million in 2014 for a two-story commercial building built a year earlier with a surface parking lot at 6101 Biscayne Boulevard. According to the Miami-Dade property appraiser’s website, the building and the land currently have a market value of $3.2 million. Lyle Chariff, whose Chariff Realty Group brokerage has about a half-dozen commercial listings in the MiMo District, said investors bought properties when retail was thriving. As a result, owners who presented aggressive revenue projections to secure loans and equity from other partners are hard-pressed to lower their asking rent prices, Chariff said. And that is putting them at a disadvantage with potential tenants, he added. Chariff said he is advising owners his brokerage represents to lower rents or accommodate potential tenants by paying for a space buildout. “The owners who are willing to make concessions are the ones filling spaces,” he said. Firms like the Comras Company, which is marketing vacant commercial spaces on 61st, 63rd, 69th, and 74th streets, have advised their clients to divide buildings into smaller bays that are fully built out and move-in ready. For example, Comras said, his company is doing leasing for a one-story building at 7400 Biscayne Boulevard that can be divided up among four individual tenants that only need 800 to 900 square feet each. At the asking rate of $40 a square foot, the landlord could end up collecting in the neighborhood of $3,200 in monthly rent from each tenant and doesn’t have to hold out for a single tenant that can take the entire building, Comras said. Zach Winkler, a senior vice president for JLL, is another broker working in the MiMo District who believes small spaces will produce better results for landlords in the neighborhood. JLL recently leased three bays in a renovated building at 6910 Biscayne Boulevard after taking over the listing from another brokerage four months ago. New tenants AT&T, sandwich joint El Bagel and pastry shop Oh My Gosh Brigadeiros all signed five-year leases for spaces that are roughly 1,250 square feet each. Asking rents for each space were $45 per square foot. Mika Mattingly, an executive vice president with Colliers International who is listing a building at 7101 Biscayne Boulevard, said that property is generating interest after just a few weeks of posting it for rent. The building had been on the sales market for six months with no takers, so the owner decided to shift gears, she said. Correction: This article has been amended to state that asking rents at 6910 Biscayne Boulevard were $45 per square foot. That rate does not necessarily reflect the final negotiated terms for all tenants.